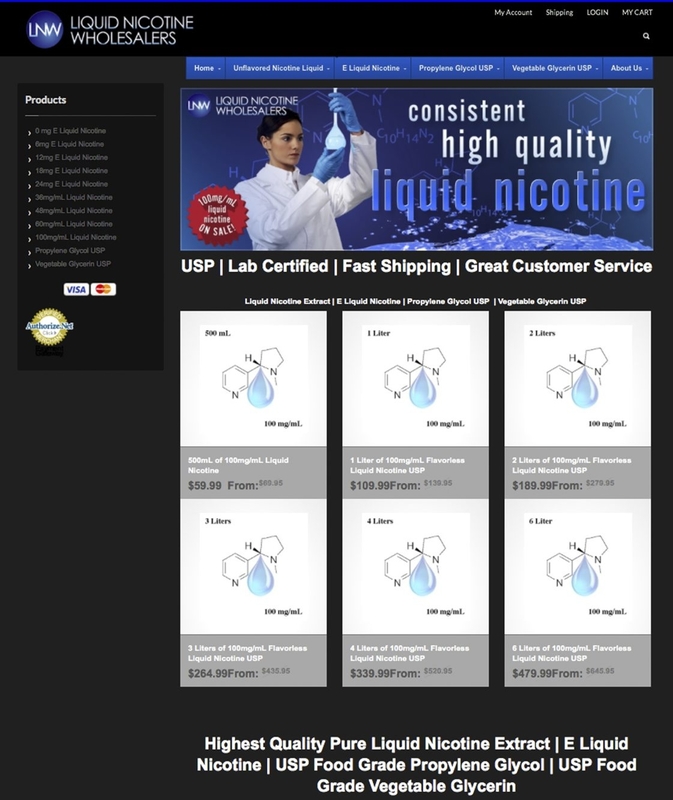 The Food and Drug Administration has yet to impose rules on the sale of e-liquids, which are readily available through websites such as the one shown above. The drug is nicotine, in its potent, liquid form – extracted from tobacco and tinctured with a cocktail of flavorings, colorings and assorted chemicals to feed the fast-growing electronic cigarette industry. These “e-liquids,” the key ingredient in e-cigarettes, are powerful neurotoxins. Tiny amounts, whether ingested or absorbed through the skin, can cause vomiting and seizures and even be lethal. A teaspoon of even highly diluted e-liquid can kill a small child. But, like e-cigarettes, e-liquids are not regulated by federal authorities. They are mixed on factory floors and in the backrooms of “vaping” shops, and they are sold legally in stores and online in small bottles that are kept casually around the house for regular refilling of e-cigarettes. Evidence of the potential dangers is emerging. Toxicologists warn that e-liquids pose a significant risk to public health, particularly to children, who may be drawn to their neon-bright colors and fragrant flavorings such as cherry, chocolate and bubble gum. Reports of accidental poisonings, notably among children, are soaring. Since 2011, there appears to have been one death in the United States, a suicide by an adult who injected nicotine. But less serious cases have led to a surge in calls to poison control centers. Nationwide, the number of cases linked to e-liquids jumped to 1,351 in 2013, a 300 percent increase from 2012, and the number is on pace to double this year, according to information from the National Poison Control Data System. Of the cases in 2013, 365 were referred to hospitals, triple the previous year’s number. Examples come from across the country. Last month, a 2-year-old girl in Oklahoma City drank a small bottle of a parent’s nicotine liquid, started vomiting and was rushed to an emergency room. That case and age group is considered typical. Of the 74 e-cigarette and nicotine poisoning cases called into Minnesota poison control in 2013, 29 involved children 2 and younger. In Oklahoma, all but two of the 25 cases in the first two months of 2014 involved children 4 and younger. In terms of the immediate poison risk, e-liquids are far more dangerous than tobacco because the liquid is absorbed more quickly, even in diluted concentrations. The surge in poisonings reflects not only the growth of e-cigarettes but also a shift in technology. Initially, many e-cigarettes were disposable devices that looked like conventional cigarettes. Increasingly, however, they are larger, reusable gadgets that can be refilled with liquid, generally a combination of nicotine, flavorings and solvents. In Kentucky, where about 40 percent of cases involved adults, one woman was admitted to the hospital with cardiac problems after her e-cigarette broke in her bed, spilling the e-liquid, which was then absorbed through her skin. The problems with adults, like those with children, owe to carelessness and lack of understanding of the risks. In the cases of exposure in children, “a lot of parents didn’t realize it was toxic until the kid started vomiting,” said Ashley Webb, director of the Kentucky Regional Poison Control Center at Kosair Children’s Hospital. Recreational use of liquid nicotine has in effect created an entire new drug category – and a controversial one. For advocates of e-cigarettes, liquid nicotine represents the fuel of a technology that might prompt people to quit smoking, and there is anecdotal evidence that is happening. But there are no long-term studies about whether e-cigarettes will be better than nicotine gum or patches at helping people quit. Nor are there studies about the long-term effects of inhaling vaporized nicotine. Unlike nicotine gums and patches, there also is no regulation of e-cigarettes or their ingredients. The Food and Drug Administration has said it plans to regulate e-cigarettes but has not disclosed how it will approach the issue. Many e-cigarette companies hope for limited regulation.